What is this? A Toyota RAV4 with a designator ZR6 ..... should it not be a RAV6? No way, it is still a RAV4, Toyota’s top-selling cross-over vehicle. A name change is not warranted for what starts life in the assembly line in the same way as all other RAV4s. But that does not last long. As the shell progresses, during assembly, a 3.5 litre V6 power plant is positioned into the engine bay. Embellishments are added in the final assembly stages to indicate that a V6 lurks in the engine compartment and a neat badge on the 5th door near the RAV4 emblem reveals "ZR6". Yes, this Toyota RAV4 is fitted with the highly regarded 3.5 litre V6 engine that produces a maximum of 201 kW at 6,200 rpm and maximum torque of 333 Nm at 4,700 rpm. Given that the GVM (gross vehicle mass) is 2,170 kilogrammes and the unladen weight of 1,665 kg that makes this machine some what of a ‘pocket rocket’. 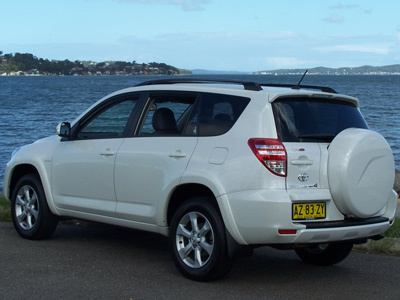 During a run northwards on the F3 Freeway out of Sydney the little wolf in sheep’s clothing had no problems sitting on the maximum signposted speed limits, which lead to some jaw dropping by some of the rubberneckers who were some what taken back at the sight of the diminutive RAV4 sitting there with the big boy's toys. Disc brakes front and rear provide the stopping ability and, as usual, includes the niceties such as ABS, EBD and BA. This is good, as it ensures straight line stopping. The ZR6 is fitted with 5 alloy wheels and 225/65R17 highway pattern tyres. A fibreglass cover conceals the spare wheel which is mounted on the rear door, freeing up the cargo area for under floor storage. By the way, there is a vast cavern there. Priced at $50,490 (recommended price not including statutory charges and delivery) the ZR6 is not cheap. But Toyota has loaded this package with a lot of goodies to tweak buyer interest. Available only with a 5 speed automatic transmission that is electronically controlled with a lock-up torque converter, the driver sits in a very comfortable seat with power controls. Five different functions are all power adjustable; however, the other front seat is all manual operation, so it will be a fight to see who drives this gem if it’s a family car. Of course, we are talking only full leather seats and naturally leather-bound gear shifter and steering wheel. A moon roof (remember the days when these glass roofs where called sun roofs) with slide or tilt positions allows for extra ventilation should you tire of the dual zone (front seat occupants only) climate control air conditioning. A satellite navigation screen fills the centre of the dash panel and it is here that we find the audio system, it has 6 speakers to cope with any type of music that may be emitted from the 4 disc (yes, 4 discs) CD player that is located behind the previously mentioned navigation screen (air conditioning settings and heater push button controls are here too). All wheels are in constant four wheel drive, but that does not mean it is an off-roader, it is a soft-roader and this consultant was quite happy to drive on the black top or good gravel roads which is possibly its best role in life. To assist in sticky situations, there is a differential lock to engage all drive wheels to prevent slipping. But you have to look for the switch; it is mounted near the glove box close to where the passenger is the best person to operate it. However don’t despair, mounted close to the driver is the hazard light switch. In our view, Toyota could do better by changing these switches around. This is the only problem the team found during our review. 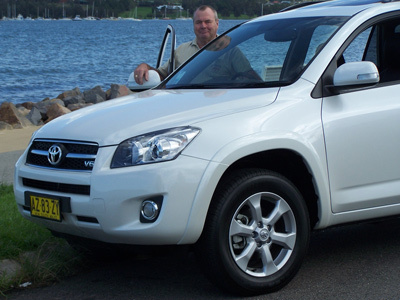 Overall the Toyota RAV4 ZR6 has the tenacity to play with the big boys; it is a stylish and very comfortable vehicle. The touring and towing capabilities are evident with a braked towing limit of 1,900 kg or 750 kg for an unbraked trailer. The fuel tank holds 60 litres of unleaded petrol. Fuel consumption figures (in accordance with ADR 81/01) on a combined highway/city cycle is quoted as 10.5 litres/100 km. Is this the car for you? We don't know, but it does have a lot to offer. We have only just touched on some points of interest. The Toyota RAV4 ZR6 is expensive, but it does have panache.